Jacob left me a note yesterday afternoon, I laughed so hard because rather than using the dry erase marker he got out a regular marker & paper and stuck it on the dry erase board. Love It! - the heart love you lots is from Amy (baby sis) when I was moving to colorado 9 years ago, I recently found it and put it up. It melts my heart. I wrote this so every time Jacob or anyone walks in our living room they know how much they mean to me. My friend Bobo was in town and doodled the owl when I wasn't looking. I liked that addition a lot! We have a crazy story about owls. Owls will always bring us back to one scary vacation! That wooden owl is PROOF! Love notes never get old. 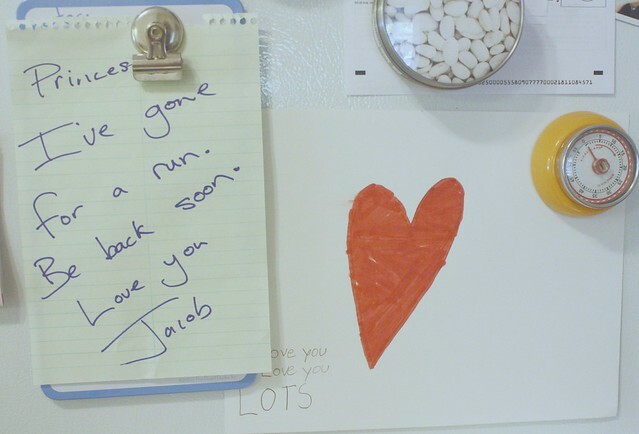 Even when I get home from work, I much rather have a note on the fridge than a typical text message. I am so sentimental that save every note I get. I have boxes of cards, boxes of notes from grade school even, and I have a few special box's titled Jacob and Brandi. Inside My Jacob and Brandi boxes are movie stubs, concert tickets, travel vouchers, hotel cards, notes, cards, any mementos from fun dates, dried out flowers...you name it. It's the small things that count right, and it's always fun to look back on. Oh memories! One of my favorite things to do is read old love letters from my parents and my grandparents. It's weird how they were people once and not just our parental units! Maybe one day our future kids will want to read ours. Who knows? Tagged: love notes. 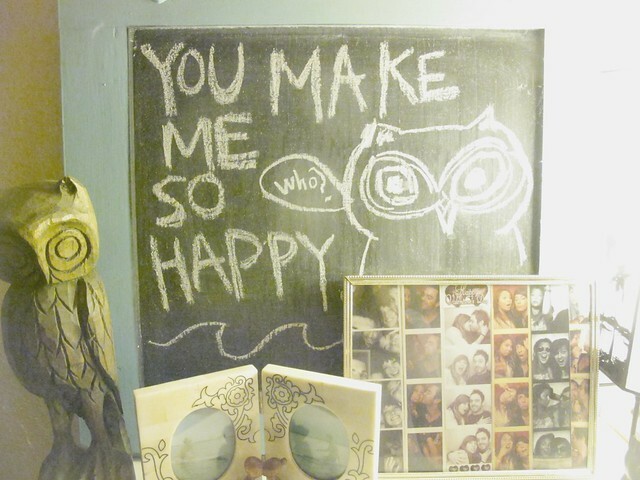 DIY chalkboard.